Police have been given the go-ahead to use potentially lethal Taser stun guns against children. The relaxing of restrictions on the use of the weapons comes despite warnings that they could trigger a heart attack in youngsters. Until now, Tasers, which emit a 50,000-volt electric shock, have been used only by specialist officers as a "non lethal" alternative to firearms. Tasers work by firing metal barbs into the skin which then discharge an electrical charge. However, they can now be used against all potentially violent offenders even if they are unarmed. It is the decision not to ban their use against minors that is likely to raise serious concerns. 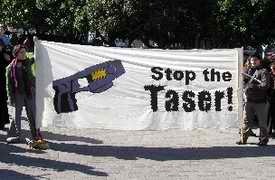 Home Office Police Minister Tony McNulty said medical assessments had confirmed the risk of death or serious injury from Tasers was "low". But he failed to mention Government advisers had also warned of a potential risk to children. The Defence Scientific Advisory Council medical committee told the Home Office that not enough was known about the health risks of using the weapons against children. The committee, which is made up of independent scientists and doctors, said that limited research suggested there was a risk children could suffer "a serious cardiac event". It recommended that officers should be "particularly vigilant" for any Taser-induced adverse response and said guidance should be amended to identify children and adults of small stature as being at potentially greater risk from the cardiac effects of Tasers. The Government scientists were also asked to test whether the weapons could cause a miscarriage if used on a pregnant woman. While not saying whether police would be allowed to Taser an expectant mother, the Home Office said the DSAC committee had "specifically asked" for computer simulations to be carried out to analyse the effect on "a pregnant female". Amnesty International claims Tasers have been responsible for 220 deaths in America since 2001. Many cities and police forces there have banned their use against minors. Two years ago in Chicago a 14-year-old boy went into cardiac arrest after being shot with one. Medics had to use a defibrillator four times to resuscitate him. The official rationale for issuing Tasers to police officers is that the electro-shock devices represent a “non-lethal” alternative to the use of a firearm in dealing with situations that threaten the life or safety of an officer or innocent bystanders. In practical terms, however, the Taser — which is proving to be a reliably lethal weapon — has become an instrument of pain compliance. In unadorned terms, this is summary punishment through torture for those who pose no threat to anyone, but who refuse to cooperate instantly with orders issued to them by police officers. The recent arrest of 72-year-old Austin grandmother Kathryn Winkfein, who was assaulted with a Taser during a traffic stop, illustrates this perfectly. After a police officer stopped Mrs. Winkfein for allegedly driving 60 in a 45 MPH zone, the grandmother refused to sign the ticket stub. Under Texas law, motorists are required to sign traffic tickets under threat of arrest. 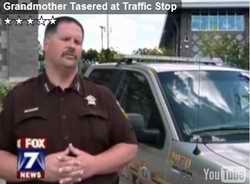 According to the police officer, Mrs. Winkfein not only refused to comply, but she swore and became violent with him. Palsied with terror over the threat posed by a frail septuagenarian woman, the officer hit her with a blast from his Taser. Mrs. Winkfein disputes every element of the official account, and intends to file a lawsuit.